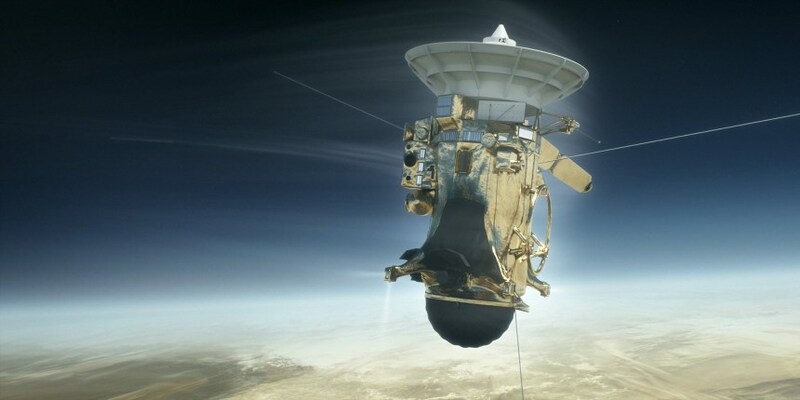 An artist’s illustration depicts Cassini as it begins to burn up in Saturn’s atmosphere. Keeping up with new developments in science, tech, and innovation during 2017 was a bit like trying to tread water during a tsunami. From a dramatic solar eclipse and breathtaking advances in gene-editing technology to the detection of ripples in space-time predicted by Einstein more than a century ago, the stories just kept coming. Here’s a recap of seven we deem especially noteworthy. A hunt for galaxies that brought the toddler universe out of its dark ages has bagged what may be the most distant specimen yet discovered, a galaxy seen as it was more than 13 billion years ago when it was just 200 million years old. The galaxy, which was found using data from the Hubble and Spitzer Space Telescopes, is seen when the universe was only 500 million years old. A munchkin by today’s standards, the galaxy’s mass was 200 million times the mass of the sun, compared with 700 billion solar masses for the Milky Way or 10 billion solar masses for the Milky Way’s smaller companion, the Large Magellanic Cloud. But the newly discovered galaxy’s age – and the preponderance of hot, massive stars it hosted – place it among a category of objects that researchers say helped convert a fog of neutral hydrogen gas permeating the ancient universe into the transparent cosmos we see today. The process, known as re-ionization, is thought to have started around 400 million years after the Big Bang, a sudden release of an enormous amount of energy that cosmologists have tagged as the birth of the universe. Over the next 600 million years, stars and galaxies formed and the universe continued to expand. Radiation from the first generations of stars – and particularly from emissions stemming from the actions of super-massive black holes at the hearts of the rising number of growing galaxies – ionized the intergalactic hydrogen, in effect lifting the fog. NASA’s chief Charlie Bolden will be at the Kennedy Space Center in Florida on Tuesday to announce where the space shuttles will spend their retirements. The 30-year-old shuttle program is ending this summer after two final flights to deliver a Hubble-class science instrument, known as the Alpha Magnetic Spectrometer, and a year’s worth of supplies to the International Space Station. Though budget uncertainties have kept NASA from moving forward with a follow-on program, the shutdown of the shuttles remains on track. Competition to house a retired spaceship has been keen. I’m not a gambler, but the Kennedy Space Center Visitors Center is an obvious pick. Why else would Bolden make his announcement here? The fleet leader, Discovery, which completed its final spaceflight last month, is promised to the Smithsonian National Air and Space Museum, which plans to showcase the ship at its Steven F. Udvar-Hazy Center in Chantilly, Va. In exchange, the Smithsonian will give up its shuttle prototype, called Enterprise. Intel’s roll out of its “Oak Trail” Atom platform is the first move in an aggressive strategy to take on ARM-based chips in the highly lucrative smartphone and tablet markets. After more than a year of saber-rattling, Intel officials have taken a significant step in their push into the mobile device space and in ramping up the competition with ARM Holdings, whose chip designs are found in most smartphones and tablets. At the Intel Developer Forum in China April 11, Intel officials unveiled its “Oak Trail” Atom platform, including the new Atom Z670. They also gave attendees a peak at the next Atom platform, dubbed “Cedar Trail,” a 32-nanometer platform that will extend Intel’s reach into a market that the giant chip maker has little if any presence. The officials said the Oak Trail chips will begin appearing in tablets in May, and that in all, more than 35 designs will start appearing from OEMs like Lenovo, Fujitsu, Evolve III, Motion Computing and Razer, running a variety of operating systems, including Windows, Android and MeeGo. Microsoft fired a broadside at Google in a battle over a US government contract, accusing its rival of issuing misleading claims. Google rejected the charges by the Seattle-based software giant in the legal tussle over a nearly $60 million contract with the US Department of Interior. Microsoft said documents unsealed in the court case showed that “Google Apps for Government,” Google’s Internet-based suite of office tools, had not been certified under the Federal Information Security Management Act (FISMA). FISMA lays out the security standards for information management systems such as email. Netbooks could be seen all over, into schools offices as well as people’s properties. Their smaller, energy weight and also may achieve only as much a warm or hot environment a average machine. The shapely small size as well as neat little form factor make them okay as carrying them in the bus, cabs and bikes, build them get it over for individuals who likes how to get alternate routes. here should be five top sellers who go about making noticeable distinction and wow it big by netbook fans.